According to a report on ESPN Deportes, Twenty-four-year-old German contender Tom Schwarz, with an unbeaten record of 24 wins and 16 knockouts, is the frontrunner to become the next opponent of Britain's Tyson Fury in his debut as Top Rank fighter. An official announcement regarding Fury's fight will be made this Saturday during Top Rank's ESPN televised card from California. Fury, is coming back from a very exciting twelve round split draw against WBC heavyweight world champion Deontay Wilder from last December at Staples Center in Los Angeles. 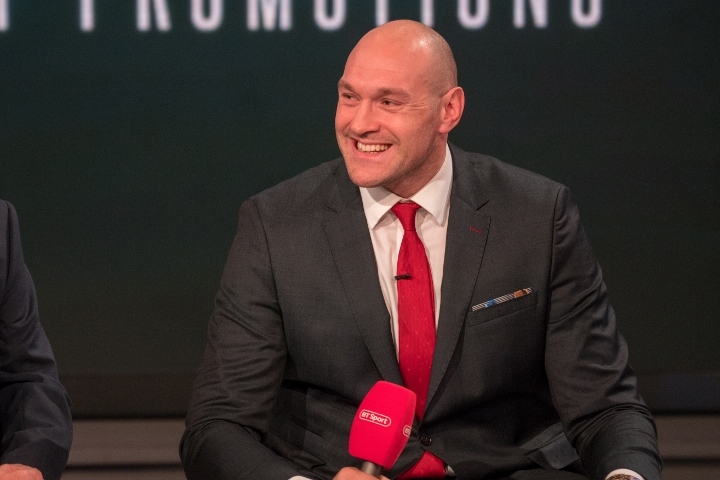 Last month, Fury (27-0-1, 19 KOs) signed a co-promotional agreement with Top Rank. His lead promoter is Frank Warren of the UK. Sources close to the organization of the Fury fight to ESPN Deportes that although several names were considered, in the end Schwarz was the one who came forward and it is simply a matter of hours before it becomes official, unless there is something that implodes the final touches. Schwarz, at nearly 6'6 and usually weighing around 24-pounds, has knocked out five of his last six opponents, but never faced anyone close to the level of Fury and only fought once outside of Germany. A few weeks ago it had been said that the Thomas & Mack Center in Las Vegas will be the venue and date of Fury's first match was being pushed as June 15. It has been said that after this fight, and perhaps one more, the tie-breaker between Fury and Wilder is viable, but much of that will depend on what takes place in the coming months in the biggest weight class in the sport. In fact, of the three main protagonists of the division, Fury is the one who seems to have the least dangerous opposition, since Joshua will face Jarrell Miller on June 1 at Madison Square Garden in New York, and Wilder will make a mandatory defense against Dominic Breazeale on May 18 at the Barclays Center in Brooklyn, New York. [QUOTE=Oshio;19608246]Selective memory is a bad thing. What about his first 37th fights? [/QUOTE] They were shlt fights, that's why I didn't bring them up. [QUOTE=Rustyman;19609356]If anyone thinks Ortiz or Breazdale or elite then they have a different definition of elite from me. [/QUOTE] Ortiz is elite, Breazeale isn't but he is his mandatory!